Clinical review: Can we predict which patients are at risk of complications following surgery? There are a vast number of operations carried out every year, with a small proportion of patients being at highest risk of mortality and morbidity. There has been considerable work to try and identify these high-risk patients. In this paper, we look in detail at the commonly used perioperative risk prediction models. Finally, we will be looking at the evolution and evidence for functional assessment and the National Surgical Quality Improvement Program (in the USA), both topical and exciting areas of perioperative prediction. There are an estimated 234 million surgical operations every year worldwide , of which 4.2 million operations are carried out in England . A precise estimation of perioperative complications and postoperative morbidity is difficult to gain, but it has been suggested this may occur in between 3 and 17% of cases [3, 4]. 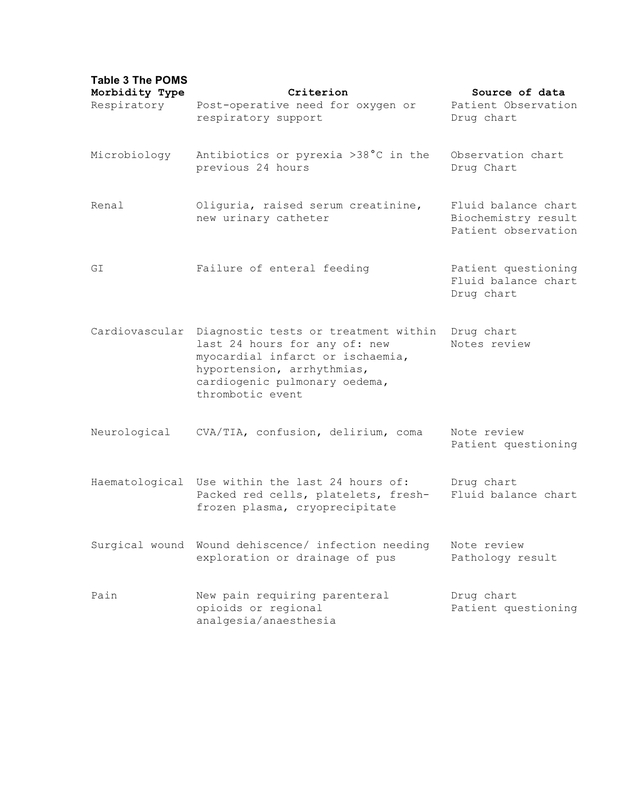 This wide range in reported complications is probably related to variable reporting, as well as disputed classification of complications. These complications cover a range of organ systems, including gastrointestinal, infectious, pulmonary, renal, haematological and cardiovascular [5, 6]. These complications can be anaesthetic related (for example, postoperative nausea and vomiting or hypoxaemia in the recovery room) or surgical (for example, wound related, ileus or haemorrhage). Postoperative mortality across all procedures is approximately 0.5%, although it may exceed 12% in older patients undergoing emergency surgery in the UK . A small high-risk group of patients has been shown to be responsible for approximately 83% of deaths and significantly longer hospital stays, despite making up only 12.5% of hospital admissions for surgery . Of note, almost 90% of the patients in this high-risk group had emergency surgery, but <15% of them were admitted to critical care directly from the operating theatre. Comparatively, cardiac surgery in traditionally high-risk patients will routinely admit the majority of its patients to critical care postoperatively. Cardiac surgery has openly published mortality rates for a number of years. These rates have demonstrated a steady improvement, with a typical mortality rate of <2 to 3% . Ideally, we would like to identify the patients who are most likely to suffer postoperative complications or mortality - both to inform the decision to operate, and to target postoperative care and critical care provision for these patients. Unfortunately, outcomes for patients undergoing surgery currently vary widely, and (particularly emergency) surgical care is often disjointed and may not be appropriately patient centred . Accurate figures for surgical complication rates are difficult to obtain because of the lack of consensus amongst surgeons on what constitutes a postoperative complication. This difficulty is further exacerbated by disagreement on a structured classification of postoperative complications and morbidity, making it difficult to compare different surgical techniques or predictive models for surgical complications. 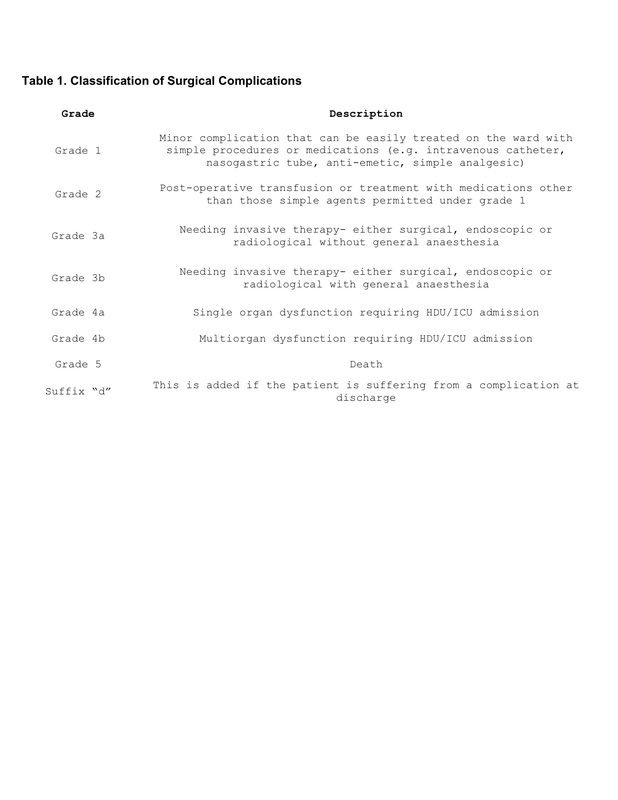 In 1992 a model for classification of surgical complications was proposed by Clavien and colleagues . Uptake of this model of classification was slow, due in part to a lack of evidence of international validation. The model was updated in 2004, and evaluated in a large cohort of patients by an international survey. This new model allows grading of postoperative complications, regardless of the initial surgery. 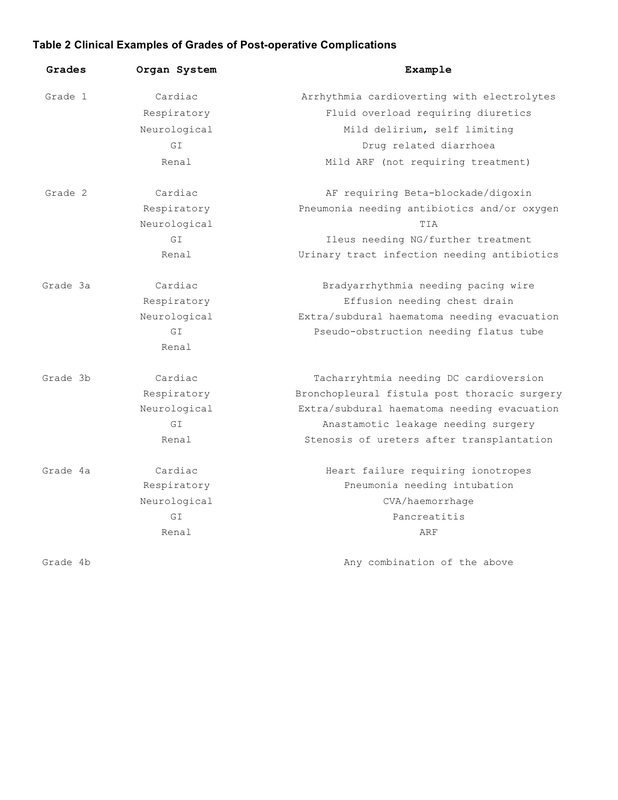 The different categories are broad, permitting clear placement of complications in the various grades (Table 1). To accurately record postoperative complications, it is important to have a validated questionnaire. The Postoperative Morbidity Survey is one such questionnaire [5, 11]. This survey is well-validated and provides objective evidence of postoperative complications, fitting the classification described above, and has been validated in a UK population  (Tables 2 and 3). There are a number of guidelines available to both aid in the identification of and guide the care of the high-risk patient. In 2010 the Association of Anaesthetists of Great Britain and Ireland published guidelines on the preoperative assessment of a patient having an anaesthetic . This document encourages a formal preoperative assessment process, which should start the process of identifying high-risk patients, as well as preparing the patient for their anaesthetic. These guidelines incorporate the guidelines issued by the National Institute for Clinical Excellence in 2003 on the use of routine preoperative tests for elective surgery . The American Heart Association published guidelines on perioperative cardiovascular evaluation and care for noncardiac surgery in 2007 . These were updated in 2009 to incorporate new evidence relating to perioperative β-blockade . Similar guidelines were also issued by the European Society of Cardiology and endorsed by the European Society of Anesthesiology in 2009 . One important predictive element suggested by the guidelines is the use of metabolic equivalents (METs): 1 MET is the oxygen consumption of a 40-year-old, 70 kg man, and is approximately 3.5 ml/minute/kg. Patients unable to reach 4 METS (equivalent of climbing a flight of stairs) are suggested to be at increased risk during surgery . The Royal College of Surgeons of England and the Department of Health have also set up a Working Group on the Perioperative Care of the Higher Risk General Surgical Patient, which has issued a set of guidelines on the care of the high-risk surgical patient . In addition to the detection of complications following surgery, these guidelines emphasise the importance of a rapid, appropriate response to limit the number and severity of complications. Part of this response would include appropriate early use of critical care facilities. Evidently it would be preferable to identify high-risk patients prior to starting any operations. To make this identification it is necessary to have an agreed definition of what constitutes a high-risk patient. The Royal College of Surgeons of England Working Group has defined a high-risk patient as one with an estimated mortality ≥5%, with consultant presence being encouraged if this value exceeds 10%. The group go on to suggest that any patients with estimated mortality >10% should be admitted to critical care postoperatively. To accurately estimate probable mortality and morbidity, we should ideally use an approach that combines the patient's physiological characteristics with the procedure to be carried out to calculate a predictive risk. The ideal risk prediction score should be simple, easily reproducible, objective, applicable to all patients and operations, and both sensitive and specific. Furthermore, this score should be equally easily applied to both the emergent and non-emergent patient and setting. Whilst in the non-emergent setting the anaesthetist has access to all of the patients' investigations and to more elaborate physiological investigations, the emergent scenario requires decisions based on the acute physiological condition and quick investigations. The two scenarios can therefore be very different, and it may not be possible to use one risk score for both emergent and non-emergent operations. There are various risk scoring systems that have been described in the literature. These systems can be classified as those estimating population risk or individual risk [18, 19]. Scores predicting individual risk can be general, organ specific, or procedure specific. It is important not to use population-based scoring systems in isolation to make individual decisions because they cannot always be extrapolated to specific patients. An example of a general score that is based on estimating population risk is the American Society of Anesthetists (ASA) classification . The ASA classification was not originally composed as a risk prediction score, although it is often used as such. The different ASA classes have been shown to be good predictors of mortality , while the rate of postoperative morbidity has also been noted to vary with class . The ASA system has the advantage of being a simple, easily applied score, which is widely known. However, the ASA classification is subjective and does not provide individual or procedure specific information. The system has also been shown to have poor sensitivity and specificity for individual patient morbidity and mortality . The Charlson Comorbidity Index is a generic score based on weighting various preoperative diseases and predicting long-term survival . This score is relatively simple to use, but also does not take into account the surgical operation, and relies on a subjective assessment of the patient, which may lead to errors. As such, it tends to be used as a research tool rather than in daily clinical practice . In 1999 Lee and colleagues published a Revised Cardiac Risk Index . This index is a scoring system used solely to predict the risk of major cardiac events after non-cardiac surgery. Whilst the Revised Cardiac Risk Index is a simple, well-validated system that also considers the scale of surgery undertaken, it can only be used to predict single-organ risk. The Acute Physiology and Chronic Health Evaluation (APACHE) score was first introduced in 1981  before the updated APACHE II score was published in 1985 . The APACHE II system assigns a score based on 12 physiological variables, with further points for age and chronic health, but it does not consider the type of surgery undertaken as the score was originally designed for use in critical care. This score therefore provides an individualised risk of mortality and morbidity, but does not differentiate between different procedures. Despite this lack of differentiation, APACHE has been shown to give a better prediction of outcome than the ASA system , and has been shown to predict different levels of surgical complications (minor, major and death). APACHE III and APACHE IV have subsequently been released, but have not been validated to the same extent as APACHE II for preoperative risk prediction. In addition, these scores are considerably more complex, requiring 17 physiological variables to be measured over the first 24 hours of critical care stay. This requirement for the variables to be recorded over the first 24 hours of critical care stay is present in all variations of the APACHE score, and is a major impediment to the regular use of this score preoperatively in emergency or urgent surgery. A derivation of the APACHE system that is useful for comparing patients with different diseases is the Simplified Acute Physiology Score II . This score also requires the collection of 17 variables over the first 24 hours of critical care stay, resulting in a predicted mortality score. The Simplified Acute Physiology Score II is not designed for use in perioperative prediction, although it can be used in this field. The Physiological and Operative Severity Score for the Enumeration of Mortality and Morbidity (POSSUM) score was designed for use in preoperative risk prediction, allowing for both individual physiological risk and the type of surgery performed . 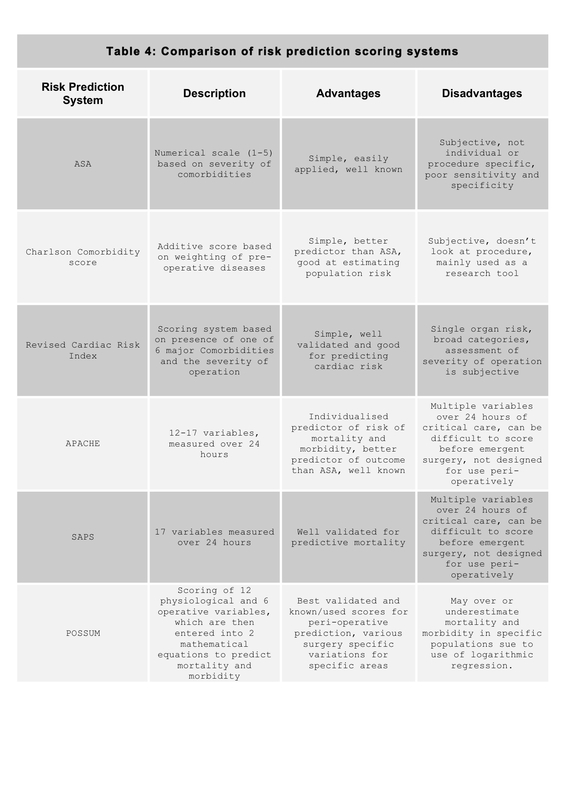 This scoring system examines 12 physiological and six operative variables, which are then entered into two mathematical equations to predict mortality and morbidity. Unfortunately, there was a tendency to overpredict mortality in low-risk patients as a result of using logistic regression to predict risk (the lowest possible mortality risk is 1.08%). In 1998 Portsmouth-POSSUM was published in an attempt to reduce this overprediction . Whilst improving the mortality scoring, Portsmouth-POSSUM did not update the equation for morbidity scoring. Another variation of POSSUM is colorectal-POSSUM, designed in 2004 for use in colorectal surgery . Despite some evidence that POSSUM may overestimate or underestimate risk in specific populations, POSSUM and its various surgery-specific iterations remain the most validated and used scoring system for predicting individual patient risk (Table 4). These scores are often used to calculate the mortality and morbidity risk prior to surgery. However, it is important to keep in mind the fact that high-risk surgery may still be of benefit in certain patients. It is also important not to base postoperative critical care admissions purely on the scoring systems above. To this end, strict admission and discharge criteria from and to a critical care unit remain difficult to objectivise. Occasionally we will see patients who do not have a high score on the above systems, but clinically are frail, have multiple minor co-morbidities, or have fewer more significant co-morbidities. Treating these cases as high-risk patients with postoperative critical care is important despite the low score. Ultimately, the various risk stratification scores can only be accurate for a proportion of patients, and there will always be patients in whom they are not accurate. These patients are those who can only be selected out through clinical acumen, or by paying attention to the much-talked-about gut feeling. Important to remember is that some scores are designed to be calculated preoperatively (POSSUM), while others are designed for postoperative use (APACHE). While the scores can be adapted and used at any stage in the patient's care, they may not be as accurate. An area of anaesthetic preoperative assessment that is receiving a high level of interest currently is functional assessment. Traditionally, functional assessment has always been a part of preoperative assessment prior to the removal of organs (pulmonary testing before pneumonectomy or dimercaptosuccinic acid scan before nephrectomy). In addition, functional testing is often used to quantify the level of disease in a patient with known disease (stress echocardiography or pulmonary function testing). Cardiopulmonary exercise testing is an integrated test that looks at both cardiac and pulmonary function. This testing involves incremental physical exercise, up to the patient's maximal level (at which they are unable to do more, or become symptomatic). Whilst doing this exercise, the ventilatory effort, inspiratory and expiratory gasses, blood pressure and electrocardiogram are recorded. These are used to calculate two values - the body's maximal oxygen uptake and the point at which anaerobic metabolism exceeds aerobic metabolism (anaerobic threshold). These figures are used to demonstrate the ability of the cardiopulmonary system to oxygenate the body. Measurement of the maximal oxygen uptake, and hence the patient's true MET status, by cardiopulmonary exercise testing has demonstrated that the traditional estimation of MET is often inaccurate. This inaccuracy has led to increased identification of patients that have increased risk without being symptomatic or having identifiable factors in their medical and anaesthetic history. Cardiopulmonary exercise testing has long been shown to have good predictive value for postoperative complications in pulmonary resection surgery [34, 35]. There is now increasing evidence for the benefit of using cardiopulmonary exercise testing in general surgery as a predictive test for postoperative morbidity and mortality [36–40]. However, there are still doubts about the evidence base in certain surgical specialties and hence the global suitability of cardiopulmonary exercise testing at present . In 1991, in the USA, the National Veterans Affairs Surgical Risk Study prospectively collected data on major operations at 44 Veterans Affairs hospitals . Based on these data, the study developed risk-adjusted models for 30-day morbidity and mortality for a number of surgical subspecialties [43, 44]. Following on from this study, the Veterans Affairs National Surgical Quality Improvement Program (NSQIP) was set up in 1994 at all of the Veterans Affairs hospitals, leading to a 45% reduction in morbidity and a 27% decrease in mortality (and hence large cost savings) . The NSQIP was subsequently expanded to include a number of university teaching hospitals in the Patient Safety in Surgery study funded by the American College of Surgeons (ACS) from 2001 to 2004. The Patient Safety in Surgery study demonstrated a significantly lower 30-day unadjusted mortality for men in the study hospital [46, 47]. As a result, in 2004 the ACS-NSQIP was started. By 2008, 198 hospitals were receiving ACS-NSQIP feedback on their outcomes . Using the hospitals with lower morbidity or mortality as benchmarks to identify the adjustable factors in poor outcomes in individual hospitals, these factors can be changed to improve outcomes [49, 50]. One example of this relates to colectomies performed in ACS-NSQIP enrolled hospitals. These operations have been shown to increasingly be performed laparoscopically in these hospitals, with significant reductions in most major complications (including surgical-site infections, pneumonia and sepsis) . One should remember despite the potential benefits of the ACS-NSQIP programme that there are limits to its usefulness. The input of data is labour intensive, and the results are only as good as the data input. Furthermore, the results are based on interpretation of data in specific categories, thus missing complications that do not fall into these specific areas [52–54]. This ACS-NSQIP programme is also building up a large database of information that should hopefully produce more effective risk stratification scores in the future. One area of healthcare policy that is very topical is the improved outcomes provided by carrying out certain operations in fewer high-volume surgical centres [55, 56]. Low-risk patients, however, have been shown to have comparable outcomes in both low-volume and high-volume centres . The moderate-risk to high-risk patients do still have better outcomes in the larger regional centres. Hence, it is important to risk stratify a patient before selecting a hospital for an elective operation (the local smaller hospital may still be an appropriate place to undergo surgery). Currently, preoperative risk stratification is often not part of the standard preoperative assessment (with the exception of the ASA classification). There are a number of reasons for this omission. The currently available scores are often complicated, needing multiple tests or time to complete. Facilities and staff time/training may not be available for functional testing. Traditionally, junior doctors, in addition to their other clinical duties, carried out preoperative assessment - they may not have been aware of the guidelines and risk stratification scores for use in surgery. Additionally, mortality and morbidity tables for individual hospitals and surgeons/surgeries are not routinely published for noncardiac surgery. As a result, this is often not a priority for hospital managers or clinicians who may or may not know accurate outcome statistics for their patients. However, the current financial restraints on the National Health Service are likely to lead to renewed efforts to reduce the length of stay in hospital by reducing postoperative morbidity. The government's stated aim to increase competition (and in so doing improve results) is likely to lead to increased interest in also reducing mortality. In the absence of a British version of NSQIP, there is likely to be increased focus on preoperative risk stratification scoring. As well as potentially reducing costs and improving performance, preoperative scoring has the potential to ensure better informed consent and patient/procedural selection, as well as appropriate targeting of postoperative critical care services. Unfortunately, all of the currently used risk scoring systems have limitations. These limitations include inter-observer variability for the ASA classification, the complicated nature and need for 24 hours of observations with APACHE, and the overestimation of mortality in lower risk groups with POSSUM. The single-organ scores are often useful in predicting organ dysfunction, but only provide a limited picture. The present limitations do not preclude the use of the tests, but ensure that it is important to select the test based on the patient population and the surgery being performed. Currently assigning patients to bands of risk (that is, high, medium or low) may be the best we can achieve, but it is still not a routine calculation. An area of great interest in preoperative assessment for elective surgery is functional testing. This area presently generates a lot of debate, with strong views on both sides. There is good evidence for the use of functional testing in specific surgical specialties. However, the situation does remain unclear in other forms of surgery. In addition, functional testing is time consuming, and requires investment and training to get started. This investment is clearly difficult at present with budgets being reduced across the board. To become established, further evidence is needed to demonstrate its relevance across all surgical specialties. This is an area that is still in its infancy, but as further research is carried out will probably become more established and see wider use. The potential to provide individualised risk prediction based on an individual's physiological response to stress is an exciting area, with the possibility of high predictive value and better use of critical resources to improve patient care. Physiological and Operative Severity Score for the Enumeration of Mortality and Morbidity.